Located in Bradenton, Florida, the Village of the Arts is an artist community overseen by the Artists Guild of Manatee, offering a wide variety of art galleries and studios, artisan boutiques, and restaurants and community venues. Located five blocks from Bradenton’s downtown region, the Village of the Arts is the community arts project of the Artists Guild of Manatee, which was formed in 1999 as a nonprofit organization for the development of a live-work artists’ community district within the city. Created as a volunteer organization with a board of trustees and committee member oversight, the Guild primarily consists of live-work artists within the Village, along with a number of dedicated community members. Since its inception, the community has become heavily populated with art-related businesses and gallery spaces and has become a major cultural center and tourist destination within the Manatee County region. Many 1920s-era bungalows and Florida Cracker houses within the district housing galleries and businesses have been restored to their historic condition and have been painted in bright and eclectic colors to reflect the artistic character of the district. Today, more than 50 galleries, restaurants, and other businesses are located within the Village of the Arts, which is governed by a legal commercial overlay allowing widespread live-work-play building use and operation. Major civic partners of the Village include the Manatee Chamber of Commerce, Keep Manatee Beautiful, Walk Bradenton, and Realize Bradenton. The village is bordered by the city’s 9th Avenue West, 17th Avenue West, 9th Street West, and 14th Street West, with more than 275 individual businesses and properties located within the region. Due to its close proximity to Bradenton’s downtown, the Village is located within easy walking distance of major area tourist attractions, including minor league ballpark McKechnie Field and downtown Bradenton’s Riverwalk. A wide variety of art galleries and studios are housed within the neighborhood, including the 14th Avenue West Studios, which showcase a working artist’s studio, and the 11th Street Gallery, which presents the mixed media works of Piltdown Studios. A number of studios showcase the works of individual artists, such as Anna D’Aste’s Little Swamp Studio and Gallery, Alisa Refoveo’s stained-glass and mosaic gallery Touch, the Joan Peters Gallery, and the Baobab Tree Gallery and Studios, which highlights the work of retired schoolteachers Christine and Gordon Turner. 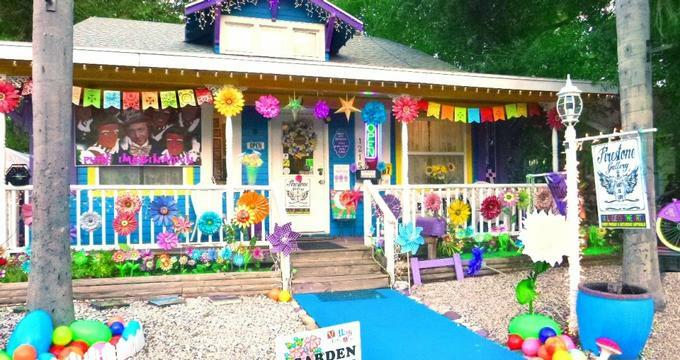 Combined music and art experiences are offered at the Dude and Mary’s Life of Art and Music gallery, while upcycling works using repurposed items are displayed at the Art Junkies gallery. Fine arts items are displayed at the Dancing Crane Gallery, including paintings and giclée items. Other art galleries and studios within the Village of the Arts include the Firestone Gallery and Design House, the P&V Art House, Still Life In G, Divine Excess Folk Art Gallery, and the EWE and EYE Gallery. In addition to art galleries, a variety of speciality shops are located within the district, including the Jerk Dog Records vinyl music store and the Village Mystic metaphysical gifts and crystals store. The Mystic Mines attraction is the only gemstone mining attraction within Southwest Florida, offering visitors chances to mine for crystals, gemstones, and fossils. Beauty services are offered at Your Boutique and Beauty Bar, while the World Piece massage parlor offers holistic healing experiences and a collection of works by local artists. A variety of award-winning and family-owned restaurants are located within the district, including the Arte Caffé Italian restaurant and pizza parlor and Ortygia, which offers authentic Sicilian, French, and Mediterranean fusion cuisine. The Bird Rock Taco Shack offers casual Mexican-inspired dishes, while Retrobaked is the region’s first gluten-free plant-based bakery. Coffee and casual dining with a traditional Italian flair is offered at CopaMoca, and locally-crafted ice cream is served at Atomic Cat Ice Cream. The Village of the Arts has partnered with a number of local and regional organizations to present community arts and civic improvement programming, including the Bradenton Herald, the United Way of Manatee County, and the Community Foundation of Sarasota County. On the first Friday and Saturday of every month, an Artwalk gallery crawl event is held, highlighting opening receptions for new art shows and live music performances. Annual special events held in the district include a Pop-Up Art Gardens annual garden tour, a Cigar Box Guitar Festival, and a Village Clean-Up Day. The Village has also partnered with the City of Bradenton to establish a number of city ordinances for district improvement, including new gateway signage and directional signposts and improved streetlighting for the neighborhood.